Did 'Iron Rain' Bypass the Moon to Fall Mostly on Earth? 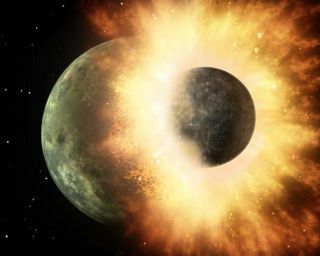 Artist’s concept of the moon-forming collision. This article was originally published on The Conversation. The publication contributed this article to Space.com's Expert Voices: Op-Ed & Insights. New experiments show that the asteroids that slammed into Earth and the moon more than 4 billion years ago were vaporised into a mist of iron. The findings, published in Nature Geoscience, suggest that the iron mist thrown up from the high velocity impacts of these asteroids travelled fast enough to escape the moon’s gravity, but stayed gravitationally stuck on more massive Earth. And these results may help explain why the chemistry of the Earth and the moon differ. When and how Earth’s metallic core formed is uncertain. Clues come from known differences in the preferences of certain elements incorporated in the silicate mantle or the metal core. In a mixture of silicate rock and iron metal, the atoms of certain elements, such as gold and platinum, tend to prefer to enter the metal, while others, such as hafnium, prefer the silicate. As Earth’s iron-rich core formed it “sucked” the metal-loving elements out of the planet’s rocky mantle. However, measurements of the silicate mantle by James Day have previously shown that there are more of them left in the shallower Earth than would be expected. This has often been attributed to a late veneer of asteroids that delivered an extra dose of metal-loving elements to the rocky mantle. The Z machine generates electric currents of up to 20 million amps, to shoot aluminium projectiles at iron targets, replicating the impacts of early asteroids. One problem with this picture has been that the abundance of the metal-loving elements on Earth is ten to a hundred times greater than that measured on the moon, which should by this argument have the same veneer. The chemical difference between Earth and the moon has been perplexing, and casts a shadow over the prevalent idea that the moon formed from the same stuff as Earth after an impact from a Mars-sized planet early in the history of the Solar System. The new paper seems to reconcile these differences. The experiment relied on Sandia National Laboratory’s “Z-machine”: a huge electromagnetic gun – twice as powerful as the world’s total generating capacity – that can launch projectiles into iron targets at ultra-high velocity. The impact experiments by Richard Kraus and colleagues show that iron vaporises under the conditions created when an asteroid crashes into Earth or the moon. A cloud of iron mist will have wrapped around the globe after any such collision, falling to Earth as metal rain. These well-mixed droplets will have become incorporated into the mantle, delivering the excess metal-loving chemicals. The results could imply that models for estimating the time scales of Earth’s core formation could be out by as much as a factor of ten, with the core forming much earlier in Earth’s history than previously recognised.